An online serialization of Email From Mars: Outbound by Lon Grover. Come back every Wednesday at 11am Eastern Time for the next exciting chapter. Subscribe to the RSS feed to get chapters as they are published. The six staterooms on the Mid-Deck are quite comfortable when compared to berthing accommodations aboard a submarine, or even an aircraft carrier for that matter. 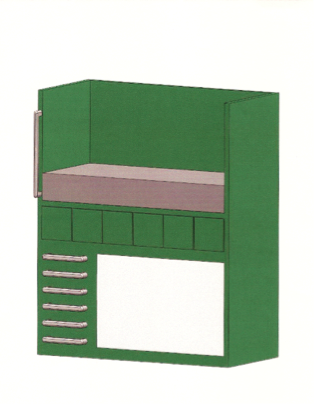 Each one is furnished with a bed having the most durable (and comfortable) twin extra-long mattress money can buy it, a desk with chair, and three personal storage compartments. Minus a sink, these are better than officers’ quarters aboard most large ships. The rooms are paired together, so that the room on the left’s bunk is placed below the room on the right’s bunk. 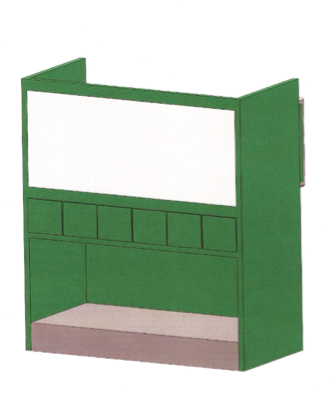 The three storage compartments are arranged horizontally and separate the top and bottom bunks, putting these cubbyholes at about chest level. They take up the space head to foot of the bunks and about half their width. The bunks also fill the space from one wall to the other, thus dividing one room from the other, providing the much-sought privacy during the two-and-a-half year mission. In an effort to transport as many supplies as possible, in the smallest space possible, Brandon came up with a novel idea of Space Utilization Through Divisional Shifts. By dividing the crew’s work schedule into three eight-hour shifts (two people on duty, two off duty, and two sleeping), four of the staterooms will be empty at any one time. Instead of leaving these spaces empty, they will utilize the four staterooms as in-transit storage for a variety of items such as inflatable Mars greenhouses, tie-down stakes, spare parts, etc. All of this equipment will be off-loaded upon arrival. During the six-month journey to Mars, the crew will only use two staterooms. The crew will each use their own pillow and sleep sack on top of the mattress, which gives them the feeling of sleeping in their own beds instead of ‘hot-bunking’ as is done on many navy ships. Once they have settled in on the planet’s surface, all six staterooms will be available. Then they will all have their own personal, but more importantly, private quarters. 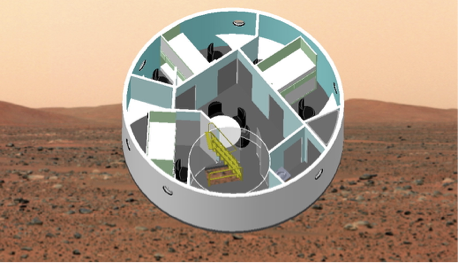 This Mars-transit sleep strategy freed up nearly 54 cubic meters of storage space. To put it another way, less spacecraft means less fuel at launch. © 2013-15 Lon Grover. All Rights Reserved. This work may not be reprinted or redistributed in any form without expressed written consent.